Themed; ‘Strengthening African Aviation in a liberalized environment,’ the conference, which attracted 463 delegates from 51 African states, called upon African countries to speed efforts and implement the Single African Air Transport Market (SAATM) and to address various challenges affecting the continent’s aviation industry. Africa’s aviation has made remarkable milestones, but there are loopholes that need to be sealed in order to attain a fast growing, productive and more liberalized industry. This was the general consensus by delegates who attended the 50th Annual General Assembly of the African Airlines Association (AFRAA) convened in Rabat, Morocco late 2018. Hon. Mohamed Sajia, Minister for Tourism, Air Transport, Handicrafts and Social Economy of the Kingdom of Morocco said liberalizing air transport market in Africa ought to be supported by all the relevant stakeholders, so that it may translate into accelerated development, enhanced competitiveness and a better service offering in the sector. “It would also help to remove the many restrictions confronting the sector; be they regulations, tariffs, airport services, or any other areas,” Hon Sajia said. 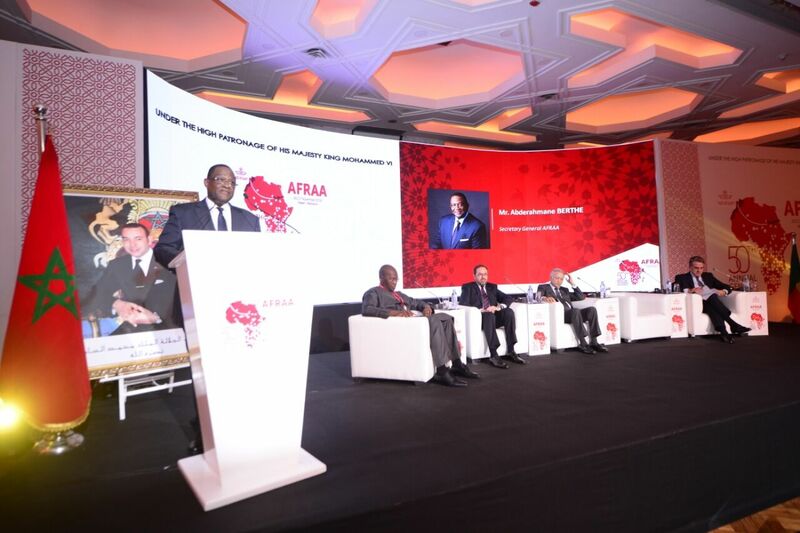 However, for the sector to realise its full potential, Abdérahmane Berthé, the Secretary General for AFRAA advises, stakeholders must begin unlocking the immense potential of the youthful workforce. It’s for this reason that he says the Association’s Assembly has called upon the global aviation sector in Africa to discuss existing barriers for gender equality in aviation and to share best practices, programmes and initiatives aimed at overcoming these barriers. “The Assembly also called African Governments to facilitate youth development in aviation through affordable training and education for safe and secure aviation in Africa, and encouraged member Airlines to prioritize youth development through their actions while putting in place necessary programmes,” the Secretary-General says. Delivering a report on the state of the Airline industry, the SG revealed that for the third time in a row, the global industry’s return on capital exceeded the cost of capital, posting USD38billion after-tax profit (representing USD9.27 average profit per passenger). The African airline industry also improved profitability during the period of review, despite making a net after-tax loss of USD100million. According to Berthé, the region’s traffic share in 2017 was 2.2 per cent of the global market, with growth rates for airlines representing 7.3 per cent for the Revenue Passenger Kilometre (RPK) and 22.9 per cent Freight and Mail Tons Kilometre (FMTK). “For AFRAA member airlines, intercontinental passenger market segment remains biggest, with 49.5 per cent of all passengers. The domestic market segment represented 23.4 per cent, while the intra-Africa market represented 27 per cent,” he explained, revealing an improvement in the passenger load factor for the airlines from 68.8 per cent in 2016 to 70.4 per cent in 2017, slightly lower than the world average load factor that currently stands at 81.5 per cent. In 2017, four African countries- South Africa, Egypt, Morocco and Algeria- exceeded 10 million passengers. Five airlines- South African Airways, Ethiopian Airlines, EgyptAir, Royal Air Maroc and Kenya Airways- flew more than 9 billion passenger kilometres. Such significant increase in flight mileage can largely be attributed to improvement in security in Africa, as the continent recorded zero jet hull losses and zero fatal accidents involving jets or turboprops for the second consecutive year, the SG says. Despite these developments, however, the region’s airline industry has for long stumbled over a number of hurdles. Key among them high cost of operations which threatens the viability of many African airlines; restriction in market access in many countries which prevents airlines from developing and expanding their networks and inadequate infrastructure for air-operator passengers and cargo in many African countries. There have also been stringent ownership and control rules in many countries hindering foreign investments in airlines; limited financial allocations to airlines (especially state controlled) and inadequate human capacity and skills requisite for the industry. In a bid to tackle some of these perennial challenges, the African Union in January 2018 launched the Single African Air Transport Market (SAATM) in Addis Ababa Ethiopia, with the aim of opening the continent’s airspace. 27 countries have so far signed the commitment. In an exclusive interview with this publication mid-July last year, Captain Gilbert Kibe, Director General for Kenya Civil Aviation Authority said SAATM would enable Kenya to gain significantly on economies of scale and the forecasted reduction in air tickets; this in addition to enhancing intra-Africa commerce. Alongside such developments, AFRAA sees an immense opportunity for African airlines in the continent’s increasing population. According to Berthé, Africa’s population will rise to 2.5billion by 2050, becoming the most populous continent mainly composed of the youth. This young population will shape the future of the continent, he says. The next game changer, he forecasts, is technology, which will simplify and sustain the growth of aviation business. “Young people in Africa have already shown their ability to not only adapt to innovations coming from other parts of the world but also to produce technologies that empower them to break the cycle of poverty and create new opportunities for themselves and their communities,” the SG says.